Traveling with the family or taking time for yourself, you'll love coming home to this beautiful home. Three bedrooms each with their own ensuite custom marble bathroom. Just a short walk to the Makuu cliffs to watch the whales go by. The Asian inspired decor is stunning. I have collected art throughout Asia and you are sure to enjoy the many carvings and paintings. The "Man Cave" has a giant flat screen TV, pool table, dart board and more. The home is on one acre and I live in a cottage on property. The landscaped property has many fruit trees for you to "pick" from. I have bikes for your use to explore the area. The home is located in the Hawaiian Paradise Park subdivision. 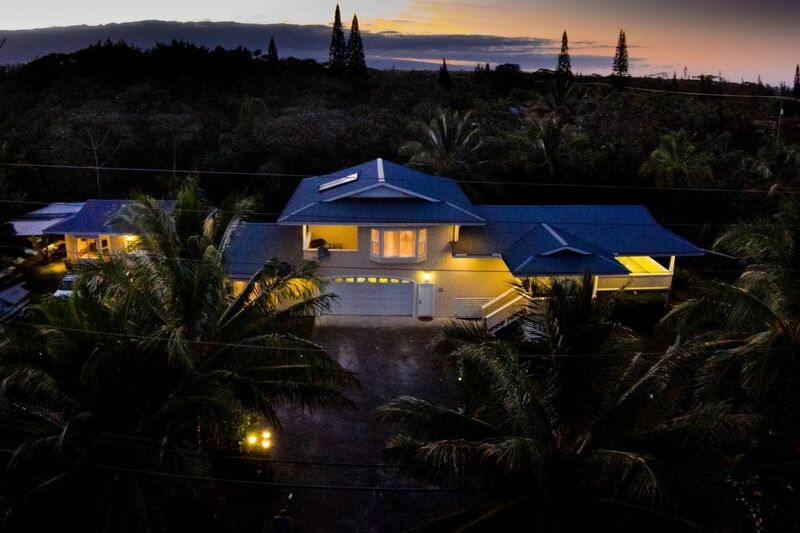 Centrally located to the airport, 20 minutes, lava flow 30 minutes and Volcano National Park 30 minutes. My name is Howard and I am a contractor on the Big Island. I built this home for myself and 2 sons. The house was a labor of love and did almost all the work myself. My sons are now grown and have families of their own and I felt that it was time to share my home with other travelers. I live in a cottage on the back of the property so I can give my guests privacy when they need it and assistance with questions or issues that may come up. I want to make sure your time on the Big Island is special. This area is the "sunshine belt" of the East side. Walking distance to the ocean and some great fishing spots. Mostly its quiet and private. Each bedroom has its own custom bath. I bought most of the tiles and cabinetry and art during my travels in Asia. Lovely home. Howard was great and patient with all the questions the elderly couple in our group had. The three bedrooms with private baths made our stay very easy. Traveling with 6 older adults is not easy. The house is clean and the kitchen is well equipped. Loved being close to the new lava flow and exploring it. Will definitely stay here again. Thanks Howard. Great vacation home in quiet neighborhood . The spacious house was ideal for a week with family and friends . When looking for comfort , quiet and privacy then look no further , this is the one . We had plenty of space to spread out and we enjoyed many meals cooked in the kitchen . Rick and Sandy ( property manager ) could not have been more hospitable . They were able to answer any questions and make sure we had everything we needed . This is a great property , we would definitely stay here again . Again , Thanks Howard for a fantastic getaway and thanks Rick & Sandy for your honestly, kindly and extra help you gave Us . Thank you so much for a great experience . We definitely recommend this rental house . Great vacation house . Such a wonderful home. Very spacious and met all of our expectations for 4 adults. Very comfortable and clean. We played pool and enjoyed having a washer and dryer right outside the door. I was surprised that laundry detergent was on the shelf! Rick and Sandy stayed in Howard's cottage next door as Howard was traveling. They really were the best hosts! They gave us many suggestions on best Farmer's Markets! I hope we come back soon! Loved the property and the house. Close to town and farmer's market. Only would recommend to have more comfortable bed's. I am glad that you enjoyed our home, it's location, and the activities near by. We try our best to make guests as comfortable as possible while here visiting the beautifull Big Island of Hawaii. This is a fairly new business for us, less than 2 years, so we still have much to learn. When we first started I purchased all new mattresses for the home, Beauty rest brand, the same brand the 5 star Hapuna Prince Hotel uses. All the beds also have an overabundance of pillows. I don't know how you could make a bed more comfortable! We are open-minded and will always search for ways to improve so guests have a comfortable & memorable stay. We arrived after dark, but the house was easy to find because Howard, the owner, has thoughtfully placed orange cones at the end of the driveway to mark the spot. The house was very spacious, with three levels, and spotlessly clean. The kitchen was well-equipped, with an entire spice rack, which was a nice touch. The bedrooms are all bright and airy; the two upstairs have their own lanais, and all three bedrooms have ensuite marble bathrooms, which were quite lovely. There were plenty of extra towels and pillows, whatever you needed. The downstairs "man cave" has a pool table, and I surprised myself by using it quite a lot! Howard has provided a number of bicycles (in very good condition), as well as boogie boards and surfboards, for additional recreation. My family enjoyed our daily breakfasts on the main lanai, which overlooked the lushly landscaped property. There were lilikoi vines growing on the fence by the driveway, and we picked a lot of fresh fruit from them. Howard stays in the guest cottage and is always there if you need him, but respects his guests' privacy completely. He was very responsive to any questions and issues we had, and I liked that he was nearby. If I every get the opportunity, I'll return with my family to this lovely house! My sisters and I and 2 nieces visited Hawaii for the first time. We chose the island of Hawaii kind of randomly and did the same with this place. We think we chose the best. The island has so much to offer and we didn't feel like we had enough time in our 5 days. The house was beautiful and had so many amenities. Howard, our host, keeps the house and land beautifully maintained. We enjoyed the bike rides with the bikes he left and cooked many meals in the house. We slept in large comfortable rooms.The deck and scenery were calming and relaxing. We drove a lot, but that's part of the charm of the big island. We were able to see so many different terrains and sites. We loved living in the rain forest. I would recommend this place and can't wait to come back with my husband and possibly kids and grandkids. I am so happy that you and your family had a good time while staying on the Big Island. I wish so much that I could have meet you! You are more than welcomed back here anytime you wish. You are now " ohana" because of your aloha! I would love to possibly meet & entertain your family, kids, & grandkids! You are allways welcomed! GOD BLESS!